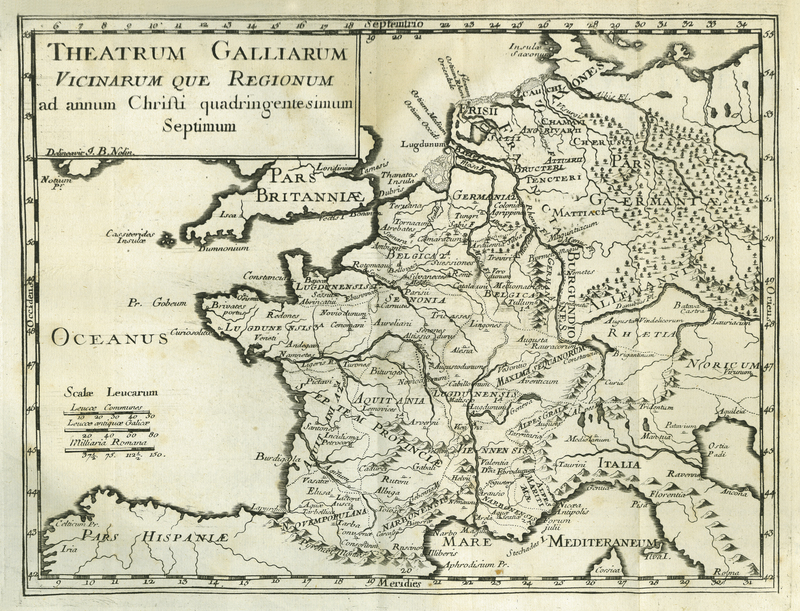 From the first century BC, after Julius Caesar’s successful military campaign (Gallic Wars, 58-50 BC), Gaul became a province of the Roman Empire. This map shows Gaul, with its Roman provinces like Lugdunensis, Aquitania, Narbonensis, and Belgica, in the beginning of the 5th century AD. It was a time of great flux for the Gallic people. The invasions of Germanic tribes like the Vandals, Sueves, and Alans in 406-07, started the process ‘where Gaul slipped from Roman to Barbarian Rule’ (Drinkwater, 1992). The Franks, Visigoths, and Burgundians also invaded Gaul in the 5th century; and by the 6th century, the Franks had united the country under Merovingian rule. [Jean-Baptiste Dubos], “Histoire Critique de l’Établissement de la Monarchie Françoise dans les Gaules. Vol. I,” ourheritage.ac.nz | OUR Heritage, accessed April 20, 2019, http://ourheritage.ac.nz/items/show/10637.